What has three teeth, no jaws or bones, lives in the river and the sea, and existed before the dinosaurs? April 17, 2015: Pesticides, mercury and flame retardants found in larvae and adult Pacific lamprey could be one of the causes of their decline, according to a recent study. With their round, thin and flexible body, Pacific lamprey look like eels. But they are really a kind of fish. They existed well before the dinosaurs and were abundant throughout the Columbia River Basin in the same areas as salmon, with numbers in the millions. Find out about the effort to conserve these ancient fish by clicking on this video. The lamprey can reach 30 inches in length and weigh more than a pound. Its mouth is adapted for sucking and clinging to rocks, which is important for conserving energy while they are negotiating swift currents. Compared to salmon, lamprey are poor swimmers, but they still can travel great distances in a short time. Lamprey are culturally important to indigenous people throughout their range, and play a vital role in the ecosystem as food to mammals, fish and birds, for nutrient cycling and storage, as well as a prey buffer for other species. 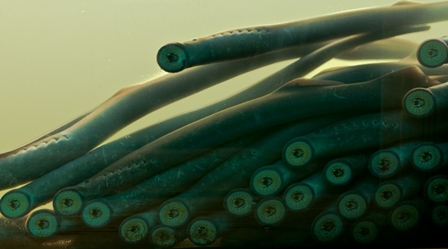 Lampreys spend most of their life as small, worm-like animals in stream sediment, feeding on algae and small organisms. After five to seven years, they mature and migrate out to the ocean. They live in the ocean for two years or so, where they mature into adults and are parasitic on larger fish and marine mammals. Like salmon, the lamprey then swim back to freshwater, where they spawn in areas similar to salmon. Watch a lamprey digging a redd (nest). They die after spawning, returning their sea nutrients to the stream for other species’ benefit. Pacific lamprey's rate of decline has been much greater than that of salmon, and today just a few thousand migrate over Bonneville Dam each year. Factors that have led to their decline include threats at all stages of their life, including dams, poor water quality, predation by nonnative species, habitat loss and degradation, decline in prey, ocean conditions, dredging and dewatering. Find out about research into lamprey propagation. Lamprey go past the dams using their mouths to cling to surfaces. (The photo on the left of this page shows lamprey going past the fish viewing window at Bonneville Dam.) Click on the video to find out more about how we're helping lamprey navigate the dams. q Lamprey hatcheries? The Northwest Fisheries Science Center and the Umatilla Tribes are working on more ways to restore this fish. Read more here. q Wow! A lot about lamprey, including Luna's amazing journey, on the U.S. Fish and Wildife Service's lamprey page here. q Find out about why Pacific lamprey matter to Columbia Basin Tribes on the Columbia River Inter-Tribal Fish Commission website. The tribes propose to restore the species to numbers adequate for tribal use and ecological health of the region. q See USFWS lamprey photos on Flickr. q Find out more about Lamprey hatchery here.